An online bachelor’s in game design provides students with the knowledge and skills necessary for professional success in video game design careers. Though initially thought of as a passing fad, video games have grown into a massive, multi-national, multi-billion dollar industry, commanding a strong influence on pop-culture, how people spend their free time and disposable income, and even childhood nostalgia. With that kind of importance, companies large and small demand highly trained professionals to design the next big games and corner the market. For individuals with a passion for gaming, anonline bachelor’s in game design degree program can provide the education necessary to turn their personal interests into a lucrative career. This article ranks the 10 best online bachelor’s in game design degree programs available today. What is a Bachelor’s in Game Design Degree? How long does it take to to complete an Online Bachelor’s in Game Design Degree Program? What are the education requirements for a Video Game Designer? What can I do with a Bachelor’s in Game Design degree? What are some Video Game Design careers? How much do individuals with a Bachelor’s in Game Design degree usually make? What is the job outlook for a Video Game Designers? Are there professional associations or organizations for Video Game Designers? What can I do with an Art & Design degree? Lindenwood University ranks #1 on The 10 Best Online Bachelor’s in Game Design Programs! 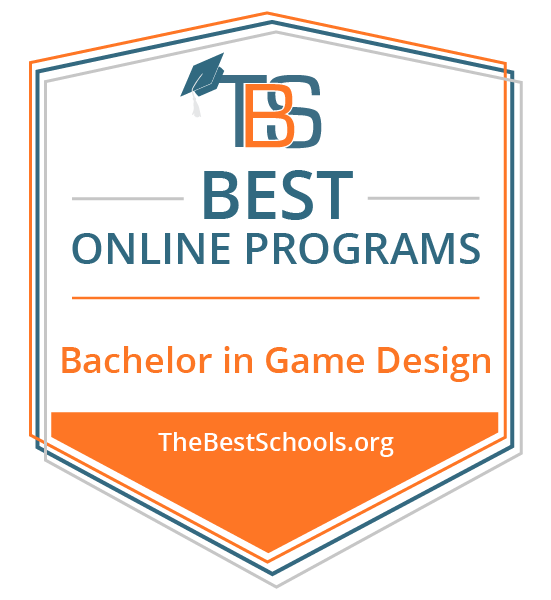 Davenport University ranks #2 on The 10 Best Online Bachelor’s in Game Design Programs! Southern New Hampshire University ranks #3 on The 10 Best Online Bachelor’s in Game Design Programs! Savannah College of Art and Design ranks #4 on The 10 Best Online Bachelor’s in Game Design Programs! Founded in 1978 with the goal of serving the unique needs of arts students, the Savannah College of Art and Design currently enrolls over 10,000 students in a variety of undergraduate and graduate programs in diverse arts fields. With online program options, as well as professional development resources, internship opportunities, and scholarship options, the College provides plenty of opportunities for growth and development to a diverse student population. Savannah College of Art and Design offers an online Bachelor of Arts in Digital Media degree program with a Game Development concentration. The program develops a balanced foundation of knowledge and skills necessary to success in game development professions. Students engage with key concepts, blending coursework in areas such as game art, programming, interactive design, and digital aesthetics, with a strong liberal arts foundation. Students prepare to enter a variety of careers, including game designer, game programmer, modeler, technical artist, and level designer. Savannah College of Art and Design is accredited by the Southern Association of Colleges and Schools Commission on Colleges (SACSCOC). Baker College ranks among The 10 Best Online Bachelor’s in Game Design Programs! The College of Information Technology at Baker College provides students with a variety of undergraduate options for studying diverse information technology fields, including web development, database administration, and game development. With a variety of online program options, professional development services, and internship opportunities, the College serves the academic and professional needs of traditional and non-traditional students alike. The College of Information Technology offers an online Bachelor of Science in Game Software Development degree program for students seeking to enter game design professionally. The program provides a comprehensive approach to the technical aspects of game design. Students engage in coursework that addresses game design principles and concepts, as well as the specifics of programming in a variety of languages, including HTML and C++. Additionally, the program includes a work experience component to provide students with exposure to the realities of professional game design. Students prepare to pursue a variety of careers in the field, including game programmer, graphics director, game designer, level designer, and engine programmer. Students in the online Bachelor of Science in Game Software Development program must also complete 300 hours of field experience. Baker College is accredited by the Higher Learning Commission (HLC). Liberty University ranks among The 10 Best Online Bachelor’s in Game Design Programs! The School of Business at Liberty University offers a variety of undergraduate, graduate, and professional programs, both on-campus and online, in diverse fields of study. Incorporating the evangelical mission of Liberty University, the School of Business builds its programs on a foundation of Christian principles. Through the Liberty University Online platform, the School of Business offers an online Bachelor of Science in Information Technology degree program with a Game Design cognate. Through a blend of IT core coursework, in-depth specialized courses in game design, and hands-on learning in an internship, students develop a strong foundation of knowledge and skills. The curriculum covers key topics, including interactive development, 3D graphics design, critical thinking and technical problem solving, and various programming languages. Students prepare to pursue a variety of careers, such as video game designer, creative director, graphics director, and software programmer. Students in the online Bachelor of Science in Information Technology program must complete an internship in the game design field. Academy of Art University ranks among The 10 Best Online Bachelor’s in Game Design Programs! One of many diverse schools at Academy of Art University, the School of Game Development provides students with a variety of undergraduate and graduate programs dedicated to the study of video game professions and design skills. Through online program options, internship opportunities, and professional development services and resources, the School serves students seeking careers in the video game field. The School of Game Development offers an online Bachelor of Science in Game Programming degree program, as well as an online Bachelor of Fine Arts in Game Development. Between these two programs, students of all backgrounds may pursue careers in game development that combine their individual talents and passions. The BS program takes a more technical approach, incorporating aspects of computer science, mathematics, programming, and engineering, while the BFA program takes a more conceptual and artistic approach, with coursework in art theory, storytelling, character development, and the history of the field. Regardless of the path chosen, students develop a balanced foundation of knowledge and skills, built on a liberal arts core. The curricula blend in-depth coursework with hands-on experience. Students prepare to enter careers such as game designer, concept artist, level designer, interactive designer, 3D modeler, and programmer. Students in both online degree programs must also complete an internship. Academy of Art University is accredited by the WASC Senior College and University Commission (WSCUC). Rocky Mountain College of Art and Design ranks among The 10 Best Online Bachelor’s in Game Design Programs! Since 1963, the Rocky Mountain College of Art and Design has provided arts students with a variety of degree and non-degree program options for honing their artistic abilities and turning their passion into a rewarding profession. Currently, the College offers programs in a diverse array of fields that include studio art, graphic design, and game design. With a dedication to the perfection of the arts, as well as professional development services and plenty of online programs, the College serves traditional and non-traditional students in numerous arts fields. The Rocky Mountain College of Art and Design offers an online Bachelor of Fine Arts in Game Art degree program for students seeking to apply their artistic skills and passion to video game professions. The program blends game design theory, practical applications and skills, basic programming concepts, artistic theory and graphic design principles, and professional skills. Students develop a well-rounded foundation of knowledge necessary to success in the field. Students prepare to pursue a variety of careers, including concept artist, level designer, animator, lighting artist and 3D modeler. The online Bachelor of Fine Arts in Game Art program requires 123 credit hours and includes core course work in key areas, including level design, visual storytelling, 3D modeling, lighting and texture, character rigging and animation, and business ethics and copyrights. The Rocky Mountain College of Art and Design is accredited by the Higher Learning Commission (HLC). University of Advancing Technology ranks among The 10 Best Online Bachelor’s in Game Design Programs! The University of Advancing Technology provides a variety of degree and non-degree programs dedicated to preparing students for a diverse array of careers utilizing the cutting edge of technology. With plenty of online program options, professional development services, and academic and professional resources, the University of Advancing Technology serves the needs of traditional and non-traditional students alike. The University of Advancing Technology offers three online degree program options, with a Bachelor of Arts in Game Design, a Bachelor of Arts in Game Art and Animation, and a Bachelor of Science in Game Programming. Each degree provides students with an in-depth education in different aspects of game development, providing more focus on the artistic aspects, the technical aspects, or the interplay between the two. The programs include theoretical and practical coursework, professional development components, and studio work. Students prepare to pursue a variety of careers in the field, including art director, concept artist, game designer, game programmer, and technical artist. Students in each of the programs must also complete a portfolio and professional component. The University of Advancing Technology is accredited by the Higher Learning Commission (HLC). The Art Institute of Pittsburgh ranks among The 10 Best Online Bachelor’s in Game Design Programs! Established in 2000, the Art Institute of Pittsburgh Online Division provides a variety of undergraduate degree and non-degree programs with the same career-readiness focus of the Institute’s main campus programs. Covering a diverse array of arts fields, including game design, fashion design, and photography, the Art Institute of Pittsburgh Online Division meets the needs of non-traditional students interested in capitalizing on their artistic skills. The Institute provides a variety of distance and online support programs and resources to ensure student success. The Art Institute of Pittsburgh Online Division offers an online Bachelor of Science in Game Art and Design degree program for students seeking to enter a variety of careers in the field. The program establishes comprehensive knowledge of the theory and practice of game design. The curriculum blends computer science and programming principles with fundamental concepts of 2-D and 3-D art and design. Students engage in theoretical coursework, hands-on design projects, and team projects to grow as well-rounded professionals. Students prepare to enter careers such as game concept artist, level designer, interactive designer, modeler, and technical artist. Students in the online Bachelor of Science in Game Art and Design program must also complete a portfolio. The Art Institute of Pittsburgh Online Division is accredited by the Middle States Commission on Higher Education (MSCHE). Established in 1979 as an audio recording workshop, Full Sail University has grown significantly to include numerous campuses worldwide, and offer undergraduate and graduate programs in a diverse array of fields. Maintaining a core dedication to career-readiness, Full Sail University focuses on the development of key knowledge and skills for success in creative professions. Students at Full Sail University benefit from access to a variety of online program options, fast-paced programs, and professional development services. Full Sail University offers an online Bachelor of Science in Game Art degree program, as well as an online Bachelor of Science in Game Design. The BS in in Game Art utilizes a greater focus on the application of art, animation, and design principles, while the BS in Game Design focuses more on structuring, planning, playability, and storytelling. Both programs prepare students to pursue a variety of careers in the field, based on their personal interests and talents. Students engage with comprehensive coursework that blends key theoretical and practical approaches to the field. Graduates of the programs may enter careers like game developer, programmer, level designer, 3D modeler, and art director. Students in the online BS programs must also complete a portfolio. Both online programs may be completed in 29 months. Full Sail University is accredited by the Accrediting Commission of Career Schools and Colleges (ACCSC). Note: Some regionally accredited colleges and universities may not accept credits from colleges and universities which don’t have regional accreditation. Though they come in several flavors, including Bachelor of Science, Bachelor of Arts, and Bachelor of Fine Arts, all Bachelor’s in Game Design degrees prepare students to pursue careers in professional video game design. Typically these programs utilize a somewhat interdisciplinary approach, incorporating a blend of art theory and training, mythology and storytelling, and technical skill and programming to develop a well-rounded foundation of knowledge. All programs incorporate studio work, many programs incorporate a portfolio or project component, and some incorporate a field-experience component. Like most bachelor’s degree programs, an online Bachelor’s in Game Design program typically requires four years for completion. However, some universities offer accelerated or degree completion programs that may be completed in as few as two years. While plenty of different video game design careers exist, they all have in common the basic prerequisite of a Bachelor’s degree in Game Design. Depending on their specific interests and talents, students may pursue programs that utilize different focuses, to ensure that they may enter their desired career after graduation. What can you do with a Bachelor’s in Game Design Degree? A Bachelor’s in Game Design degree prepares students to pursue a variety of general or niche careers in the game design field. With this degree, graduates may enter careers in the conceptual, artistic development of games, or the technical, nuts-and-bolts aspects of game design. Individuals may find employment at massive multinational gaming companies, small independent publishers, or even start their own game design firm. Specific salaries for video game design professions depend on place of employment, experience, specific job responsibilities, and other factors. As of 2015, according to Sokanu.com, video game designers in the US currently see an average annual salary of $85,240, drawing from a pool of 233,000 members. Entry-level video game designers can expect a salary around the average of $45,320, while top-end video game designers can expect a salary around the average of $129,700. According to Sokanu.com, between 2014 and 2024 the video game design job market should grow by 3.3% from its current population of 233,000 members, providing plenty of new jobs for talented game designers. As with other niche fields, job availability for video game designers depends on location, with most of the jobs concentrated in California, Illinois, and Maryland. International Game Developers Association (IGDA) – With 90 chapters worldwide, the IGDA maintains its mission of advancing the careers of its members through a commitment to four key principles: advocacy, networking and community, professional development, and international reach. Membership includes benefits such as access to professional resources and publications, access to events and conventions, and a large member network. Entertainment Software Association (ESA) – The ESA dedicates its activities to serving the needs of businesses, publishers, and individuals in the industry. Moreover, through the ESA Foundation, the ESA provides scholarships for video game design students. Membership includes benefits such as access to resources and publications, access to conventions and events, legal resources, and a large member network.